I love that we have a history with people in our life, today. I love that we live in an area where connections are made, grow and protected! So as we celebrate the birthday of my daughter's friend, Ashlyn, I couldn't help smiling. This sweet girl who was in her momma's tummy at the same time as my daughter... as her mom and I served in church and at MOPS. Now, as our girls are growing up together and our friendship continues.. this sweet card celebrates the lovely birthday of this 6 year old sunshine filled girl. Send some sunshine with this quick and pretty card (and the must-have, soon-to-retire papers and stamps). Use the Stazon Jet Black ink pad to stamp this sweet cupcake birthday wish on the Whisper White card stock. 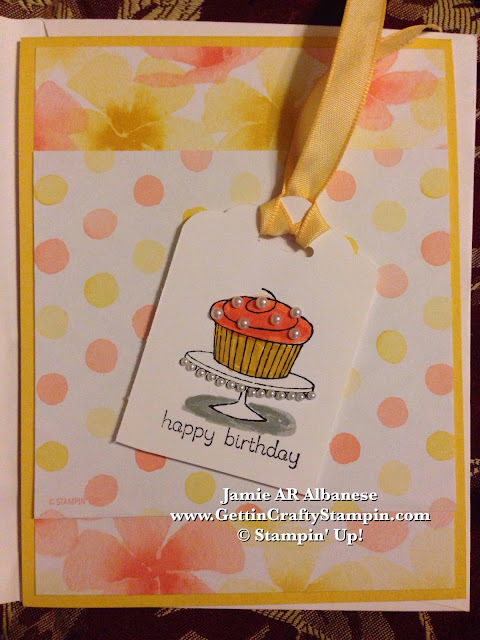 Color the Cupcake in with the Daffodil Delight and Tangerine Tango Stampin' Write Markers. Add a shadow under the cake stand with the Smoky Slate Stampin' Write Marker. 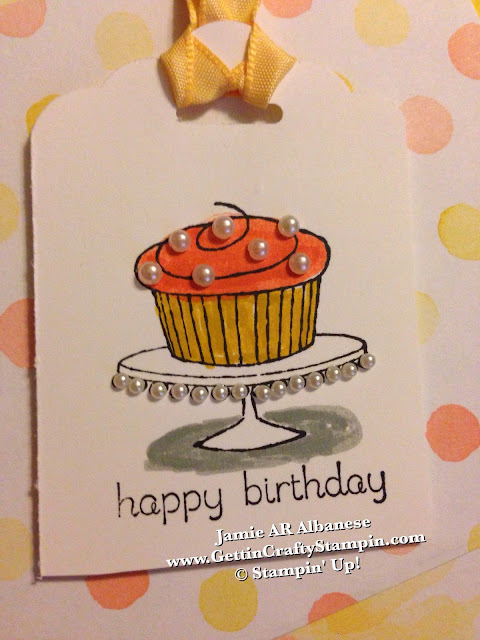 Accent the cupcake and stand with the adhesive backed Pearl Jewels. This is super sweet - just like the little girl who is receiving it! It's so easy to add a luxurious accent with these pretties! 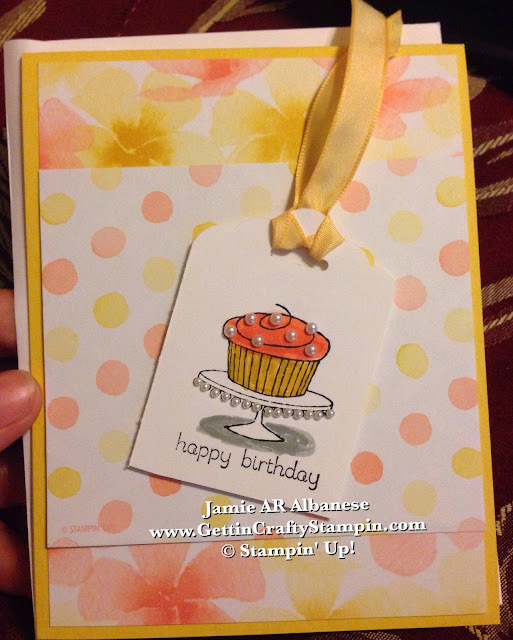 Punch the top of the stamped image with the Scallop Tag Topper Punch for this pretty accent. Loop the Daffodil Delight Ribbon through for a color coordinated accent. With the Stampin' Dimensional adhesive Layer over these two pages from the Watercolor Wonder Designer Series Paper for a pretty feminine and fun accent. The blessing of watching my kids grow is amazing. Seeing the kids we've know since before birth or since PreSchool/Kindergarten is so very cool! Here my kids are blessed to grow up with kids and form life-long relationships while I am blessed with wonderful friends! Here is a sweet card for a sweet girl who turned 6 this week. May we enjoy many years of friendship and growing up, supporting one another.. Making a sweet, easy and pretty card quickly that is sure to celebrate those who are special in your life!